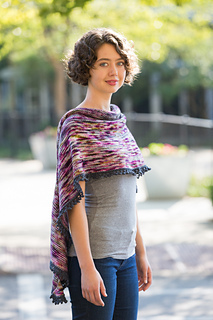 One size, easily adjustable (approximately 16” (41 cm) long at longest center section and 72” (183 cm) wide across top edge. 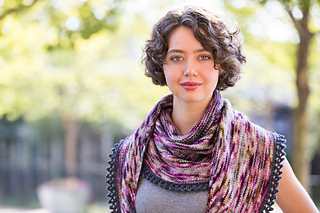 Worn as a wrap or scarf, Molly Walker was created to showcase variegated yarns. 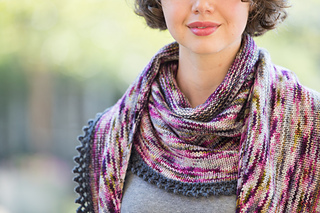 Grab your favorite variegated yarn and add a dramatic, or not so dramatic, pop of color along the bottom edge. The possibilities are endless. 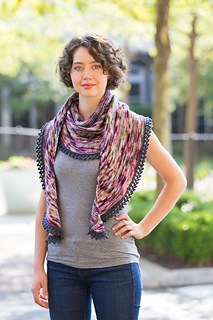 Instructions are included to adjust the size of your scarf/shawl. Finished Measurements: Approximately 16” (41 cm) long at longest center section and 72” (183 cm) wide across top edge. 700 yards of worsted weight yarn. 560 yds (512 m) MC and 120 yds (110 m) CC. 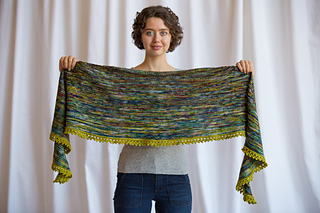 Shown using Miss Babs Yowza Whatta Skein (560 yd/226 g skein); 100% Merino. MC: Shining City. CC: Gray. Gauge: 15 sts/29 rows = 4”/10 cm in stockinette after blocking. 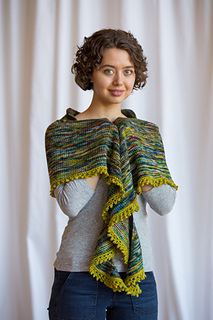 Gauge is not critical for this project, but will affect the finished size and yardage. Needles: US#8/5.0 mm 32”/80 cm circular needle, or size needed to obtain gauge.